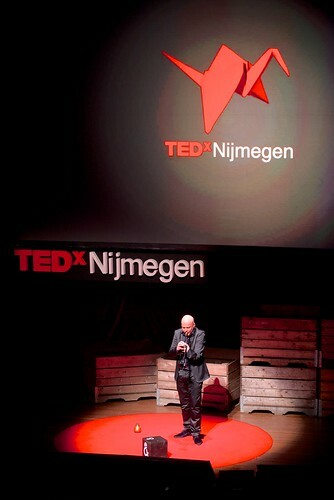 Andre Heuvelman: Standing on a cube, in space! On a cube he stood… fragile, confident and breath-taking. I felt butterflies in my stomach when André Heuvelman played the trumpet just now in his TEDtalk, combining a life-story, with beautiful music. Being young, André wanted to be normal, not handicapped by his shorter left arm. He wanted to play the trumpet, but doctors told him he should wear a brace to support the heavy instrument. “No way!”, he said, he wanted to be normal. Instead he went wind-surfing, making his arm so strong he could do without the brace. Windsurfing made him the great musician he now is, simply by not being afraid of the water and the wind. Surely, André moved the whole audience, because the empowerment of his excellent music was palpable. At this moment, listening to the music, I dozed off, letting my imagination flow free. I remembered all the talks I heard today, and thought about life. Actually, I thought more about the flipside: death, because I suddenly got a scary thought. I wondered about the impossible choice between mortality and immortality. Given the choice, what would you do? Think you would choose immortality, being a superhero? Think again! I saw myself conquering death, being indestructible and live forever, and it was not pretty… First I lost all my family and friends, they died. Then I outlived all people because the human species was attacked by powerful aliens. A meteor rock evaporated earth and, while I had some fun at first floating from star to star, I soon got bored since there was no-one to play with. I was totally alone, for eternity! A scary thought, but it made me realise that death isn’t such a bad thing and in the meanwhile I should live life to the fullest. Go after my dreams, like André did. His message seems clear, music can be a vessel of hope, a driving force to happiness. He made it very clear to me, and surely many people more, that if we stay connected to each other, throughout heartache we might experience, we should not fear. As long as we stay with both feet on the ground, or on a cube apparently, close to our family and friends, U&I will always have a safe haven to turn to. Don’t Blame Me… Blame My Default Brain!